As you probably know, I love Dungeons & Dragons, and my favorite settings are historical (or, frankly, pseudo-historical) ones. Inspired by Scott Bennie’s amazing “Testament: Roleplaying in the Biblical Era” and by my current Ancient Mesopotamia D&D campaign, I hereby present a homebrew D&D class I’ve been working on for several months: the Priest, keeper of secrets, shepherd of the community, worshipper of idols! The Priest is a totally unofficial, fan-created, no-relation-to-the-good-folks-at-Wizards-of-the-Coast D&D class which I’ve statted out up to 20th level, with several variant builds (chiefly the Idol Aspects through which the priest worships their god: Praisehungry, Resplendent, Mortifying, Ecstatic and Bloodthirsty). 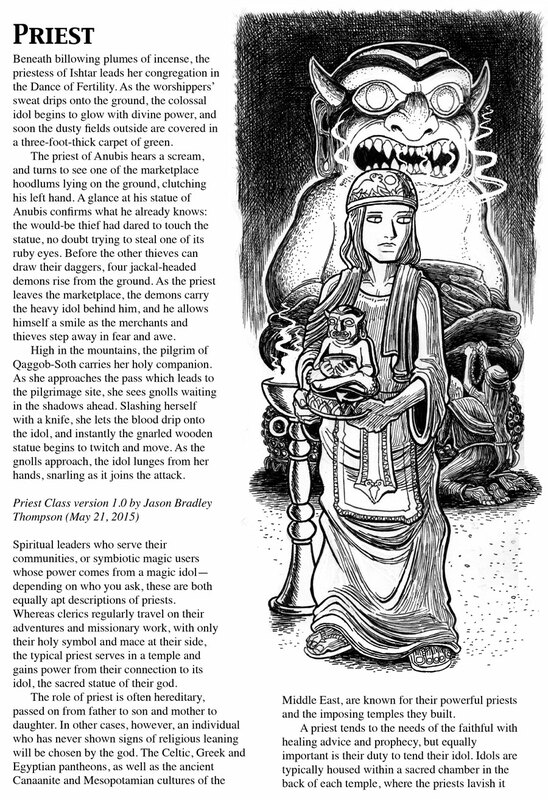 As I explain briefly in the PDF, the Priest is an attempt to transform the D&D Cleric class back into something like the archetype of the ‘mysterious high priest’ as seen in an earlier type of fantasy fiction. The Cleric is basically a crusader/undead-buster class at heart, a holy warrior, but there’s plenty of precedent in fantasy for a different type of holy character… one who’s mysterious, a master of illusion and enchantment as well as of healing, more like a wizard than a cleric. This, plus much inspiration and flavor from real-world iconodulic religions, equals the Priest! This is something I’ve been working on for awhile, and it probably still needs more tinkering and playtesting (many thanks to Shanti, the awesomest playtester ever!). But it’s the kind of thing where you’ve got to just throw it out there and see if it sinks or swims and what people think. The Priest’s special spell focus — the idol — makes an interesting roleplaying challenge, and some campaigns might prefer to have priests as NPCs (antagonists perhaps?) rather than player characters. Do whatever you like with it, but let me know what you think! This has been a fun vanity project inspired by my love of D&D, and if you get some enjoyment out of it, and best of all can use it in your own game, I’ll be super happy. UPDATE: SEPTEMBER 6, 2016: A much-updated version of the Priest is now available as the Priestess, a community-created D&D 5e product on Dungeon Master’s Guild! Please check it out and if you like it, throw me and the artist a few bucks!